The Gentoo Penguin (pronounced /ˈdʒɛntuː/), Pygoscelis papua, is easily recognized by the wide white stripe extending like a bonnet across the top of its head. Chicks have grey backs with white fronts. Adult Gentoos reach a height of 51 to 90 cm (20-36 in), making them the largest penguins outside of the two giant species, the Emperor Penguin and the King Penguin. Males have a maximum weight of about 8.5 kg (18.8 lbs) just before moulting, and a minimum weight of about 4.9 kg (10.8 lbs) just before mating. For females the maximum weight is 8.2 kg (18 lbs) just before moulting, but their weight drops to as little as 4.5 kg (10 lbs) when guarding the chicks in the nest. Birds from the north are on average 700 g (1.5 lbs) and 10 cm (4 in) taller than southern birds. 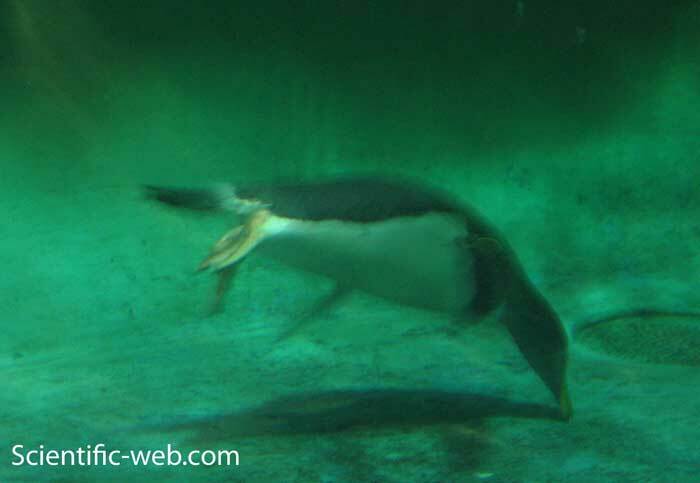 The Gentoo They are the fastest underwater swimming penguins, reaching speeds of 36 km/h. The Gentoo is built for very cold weather environments, unlike its northern cousin the Magellanic Penguin, which is leaner and more mobile in terrestrial movement. 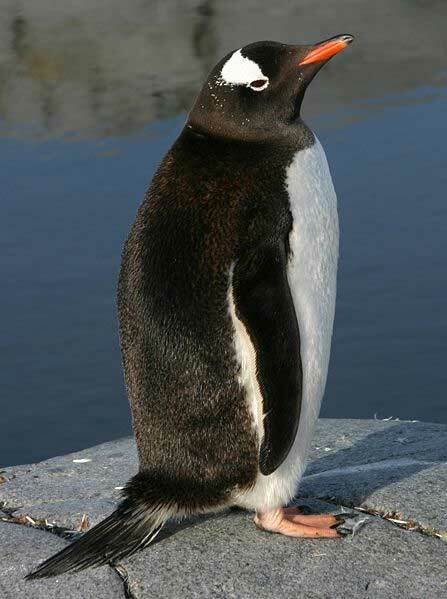 In the water, sea lions, leopard seals, and orca are all predators of the Gentoo. On land there are no predators of full grown Gentoos, but birds have been known to steal their eggs and chicks. 3. ^ Baker AJ, Pereira SL, Haddrath OP, Edge KA (2006). "Multiple gene evidence for expansion of extant penguins out of Antarctica due to global cooling". Proc Biol Sci. 273 (1582): 11–17. doi:10.1098/rspb.2005.3260. PMID 16519228. http://www.pubmedcentral.nih.gov/articlerender.fcgi?artid=1560011. Retrieved on 21 March 2008.